I'm a big of learning from data. 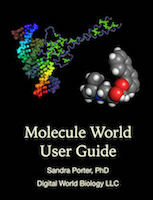 There are many things we can learn about swine flu and other kinds of flu by using public databases. In digital biology activity 1, we learned about the kinds of creatures that can get flu. Personally, I'm a little skeptical about the blowfly, but... Now, you might wonder, what kinds of flu do these different creatures get? Are they all getting H1N1, or do they get different variations? What are H and N anyway? We can discuss all of these, but for now, lets see what kinds of flu strains infect different kinds of creatures. Activity 2. What flu infects who? 1. 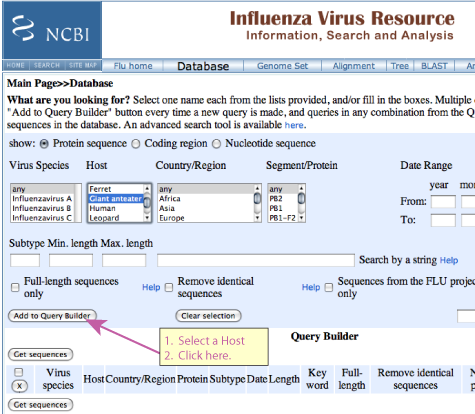 Go to the NCBI viral resource database (it will open in a new window). 2. Pick a creature from the Host menu. 4. Click the "Get Sequences" button. 5. Look at your results.